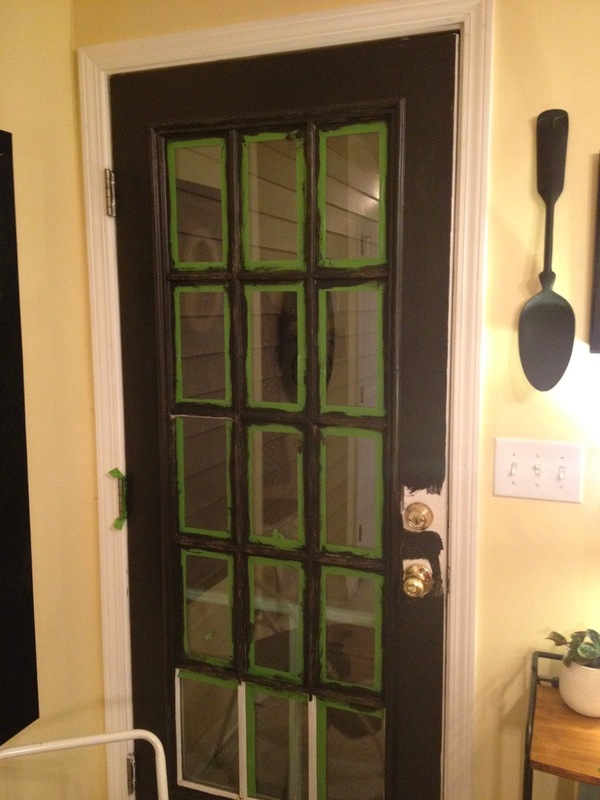 Dwell by Cheryl: "The Painted Back Door"
Every now and again I get a wild hair and start a spur of the moment DIY project. Oh who am I kidding? Often, I get a wild hair and start a spur of the moment DIY project and a couple of weeks ago I did just that. It was the start of my vacation and I'd been contemplating painting my back door for months. 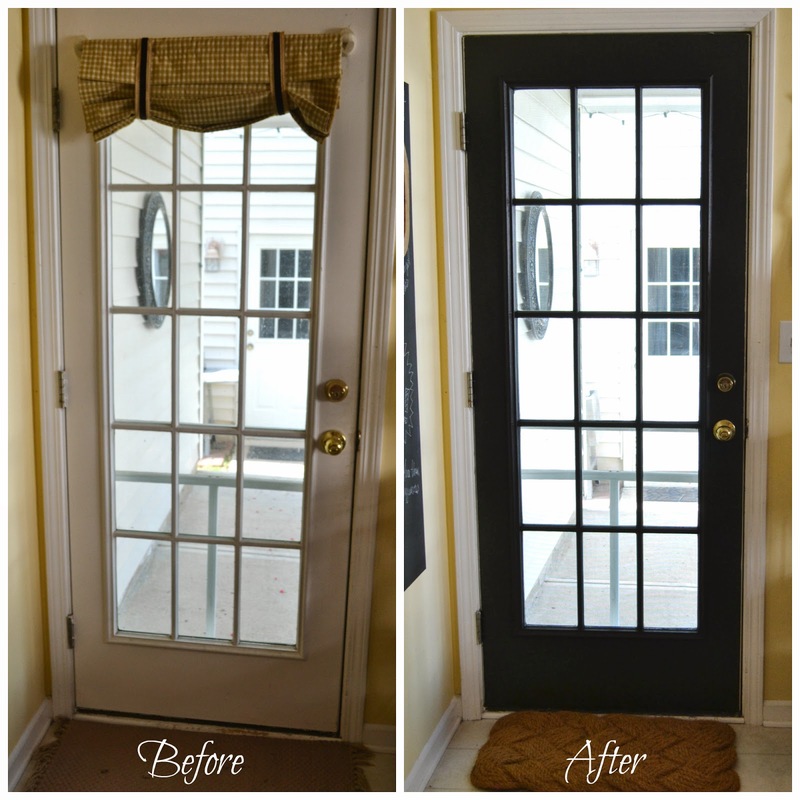 It actually started after the interior front door painting (CLICK HERE) DIY project. After the front turned out so well, I'd sit on my sofa and stare at the back door and think about how very sad it looked. So I finally bit the bullet and jumped in head first at about 9:00 p.m. I do that. For this one, I went back to the leftover paint from the front door project and it worked just as well here. 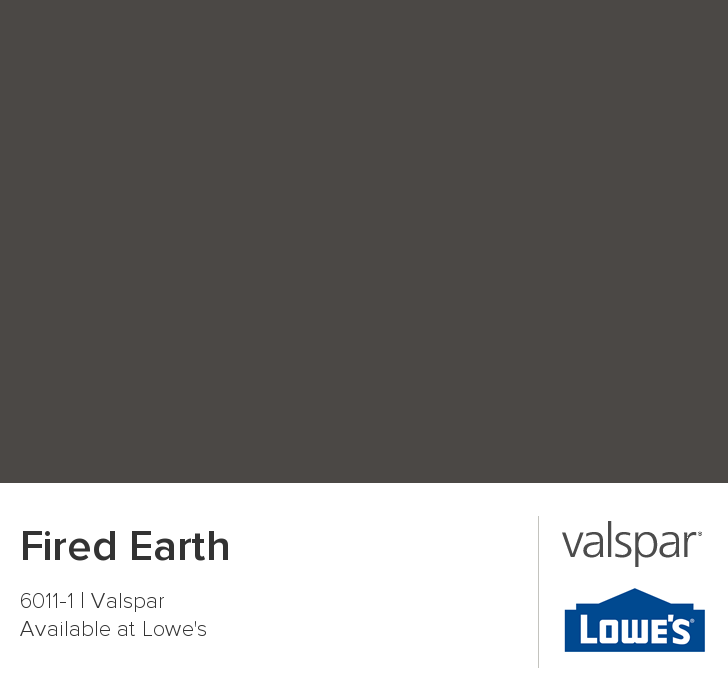 I'm a big fan of Valspar Ultra (Paint and Primer in One) and I used the satin interior finish. The paint covered well as usual and I love the rich very dark gray. Well, by about 11:00 that evening, I was out of steam and out of painter's tape so I called it a night. It just so happened that I was leaving for vacation the next day so I ended up leaving it just like this for over a week. Yeah, I do THAT too. Well, this weekend I was back at it again, determined to finish up the project. Initially I figured it would be pretty simple given the fact that there really isn't much "door" to paint. I was WRONG. 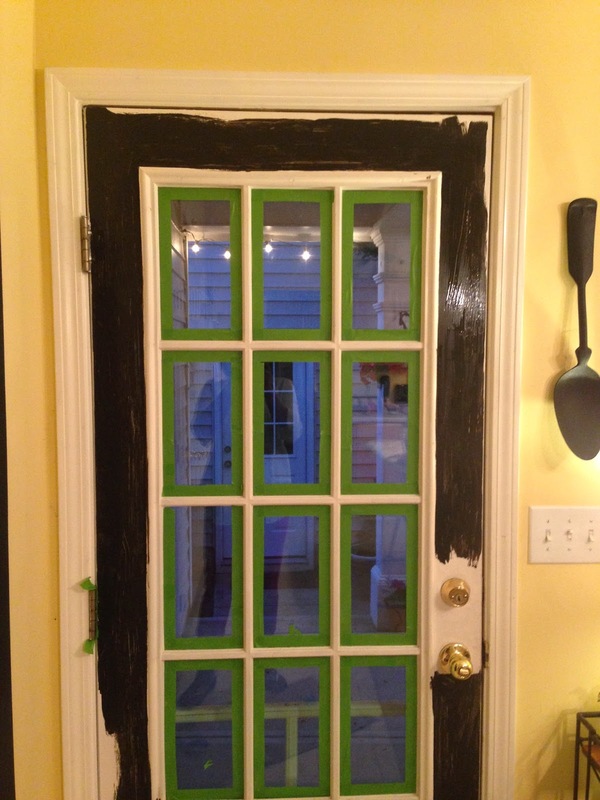 It turns out taping off and painting the muntins on the door (wood grid on the glass insert) was a major pain. You need to get the painter's tape perfectly lined up or you end up having to touch up areas or scrape paint off the glass. Either way, it wasn't fun. Of course, the good DIY projects never are. Given the door was painted white previously, I had to get in every little nook and cranny. It was pretty tedious work and I'd say all total, I spent about 5 hours on the project. It wasn't difficult just tedious. 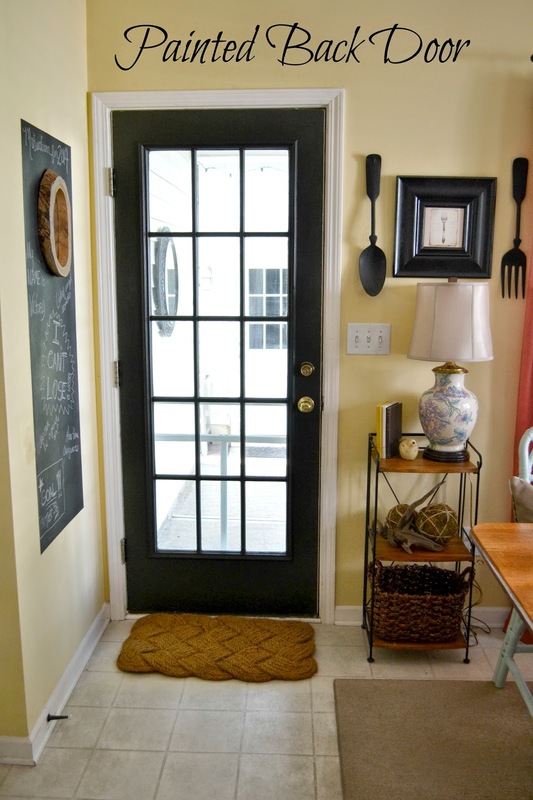 I love that now when I sit on my sofa and look back into the kitchen, the crisp black door is staring back at me. 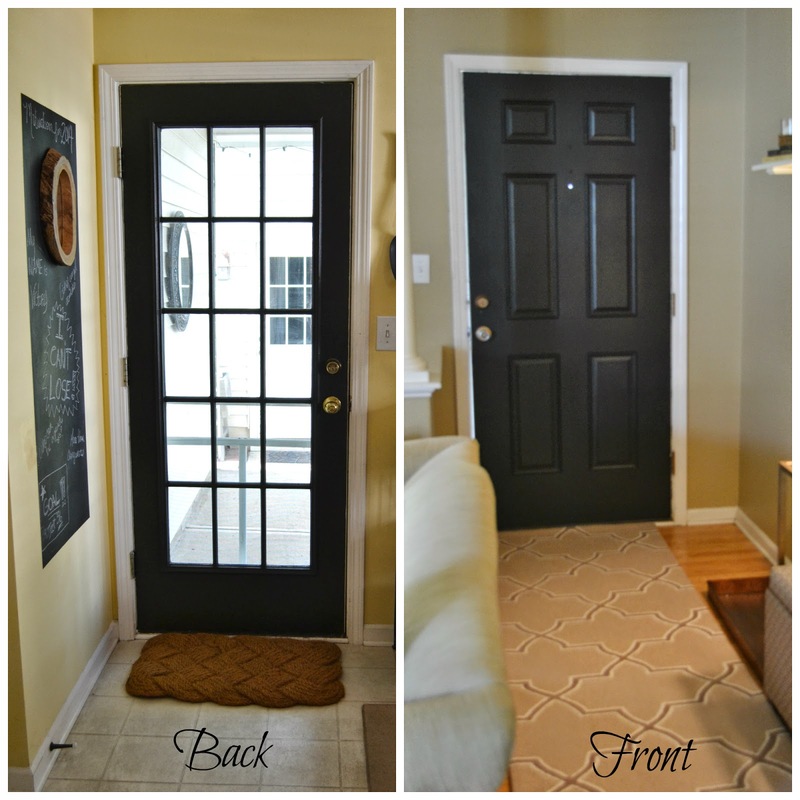 It's also a big plus that now the interior of the front door and the back door match. Because who wants mismatched front and back doors? Lol!